Atletico blow a chance to close the gap on Real. Kaka comes good at the death. Inzaghi living on borrowed time. Kaka celebrates his last gasp equaliser on his MLS debut. On Friday we posed the following questions. • Could PSG achieve an unprecedented domestic treble? It remains tight at the top in France. Lyon, inspired by two goals from leading scorer Alexandre Lacazette, strolled to a 5-1 victory at Montpelier on Sunday. That win keeps them a point ahead of reigning champions PSG who put four past Lens. Marseille defeated 6-1 and are still in contention in what looks like being one of the most exciting climaxes to a French league season in many years. • Can anyone stop Bas Dost? The Dutch striker had scored 14 goals in previous 10 games for Wolfsburg as they embarked upon a wonderful start to the second half of the season. Their post-Christmas unbeaten run came to an end on Saturday when they were beaten 1-0 by Augsburg. That defeat leaves Dieter Hecking’s side 11 points behind leaders Bayern Munich and may have ended their slim chances of challenging for the Bundesliga title. 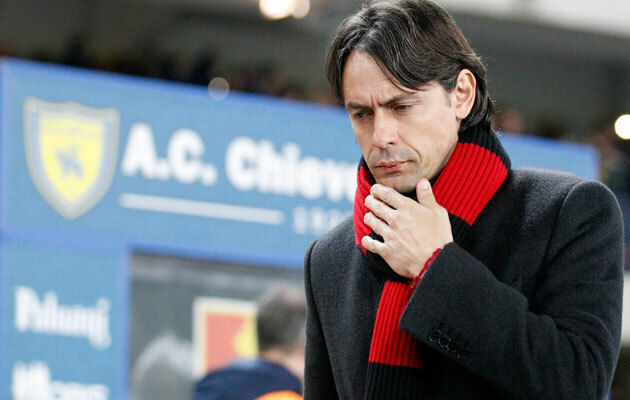 Milan coach Filippo Inzaghi has much to ponder after watching his side throw away all three points. • Would defeat by Verona cost Inzaghi his job? Milan avoided defeat but a 2-2 draw against Verona scarcely improved Inzaghi’s standing at Milan. An equaliser conceded in the dying seconds of injury time cost the Rossoneri all three points. There were reports of club owner Silvio Berlusconi meeting with Milan’s vice-president, Adriano Galliani to discuss the manager’s future on Sunday evening. The word in Italy, though, is that he will be given at least until next Monday’s game with Fiorentina to preserve his job. • Will Atletico get back on track? Atletico, with just five wins in their preceding 13 games in all competitions, were unable to get their season back on track as they were held to a 1-1 draw by fourth-placed Valencia. A frustrating afternoon for the champions, who were failed to take advantage of Real Madrid’s stumbling to a 1-0 defeat to Athletic Bilbao. Barcelona are now in pole position, a point ahead of Real with Atletico a further six points adrift. • Can two old stagers roll back the years in MLS? Honours even in the seasonal opener between MLS debutants Orlando City and New York City. The match, which brought together two recent greats of the game in Brazilian Kaka and Spain’s World Cup winner David Villa, ended in a 1-1 draw. In front of a 62,000 sell out crowd it was Kaka who took centre stage, scoring a stoppage time equaliser, albeit via a deflected free-kick.